The Moroccan city of Marrakech is made for shopping, with only a smattering of sights to detain you from the fine retail therapy. 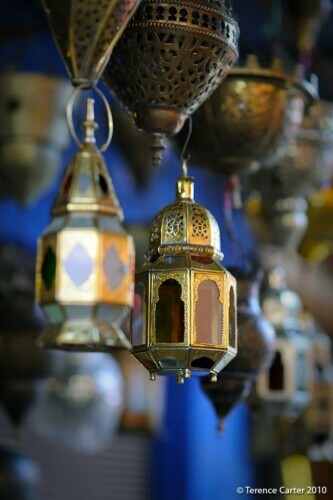 Our Marrakech medina meander, a self-guided shopping themed walking tour, takes in some of the best browsing in the souqs. Our Marrakech medina meander has been inspired by our daily strolls through the covered markets or souqs (also spelt ‘souks’) of Marrakech. We were lucky that the location of our riad Dar Rocmarra in the northwestern part of the medina (old town) near Bab Doukkala, took us along a route that ran right through the souqs to reach the main square, Place Djemaa Al Fna. It therefore made sense that we should create a self-guided shopping-themed walking tour for you. 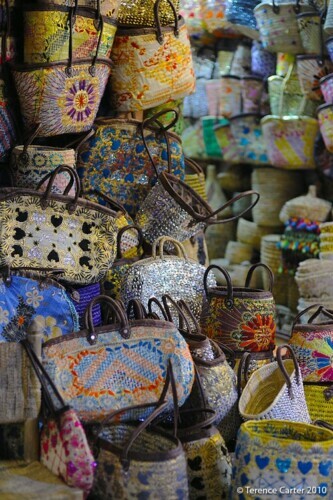 Marrakech Medina Meander: a Shopping Themed Walking Tour. Marrakech, Morocco. Copyright 2014 Terence Carter / Grantourismo. All Rights Reserved. Our Marrakech medina meander starts seconds from our doorstep on Rue Dar El Bacha. The street is semi-pedestrianised, by which we mean there are no cars, only an endless stream of motorbikes, bicycles, donkeys and carts, so take care. It’s named after Dar El Bacha, also known as Dar El Glaoui, a palace that once housed Pacha Thami El Glaoui and his harem. Avoid taking photos of the monumental gate, which will get you a warning from the policeman on duty outside. 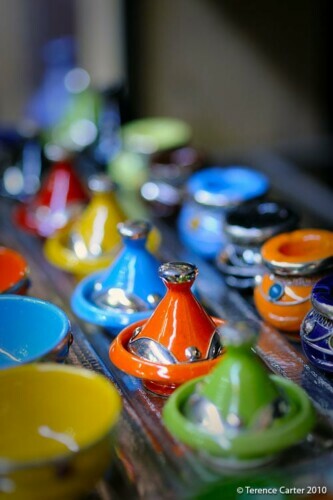 The street is dotted with some of the medina’s finest shops, such as Zimroda Arts, Khalid Art and Siwa, which specialises in Oriental carpets, antiques, beautiful Berber jewellery, and sumptuous decorative objects – with prices to match of course. Rue Dar El Bacha is also home to several fondouks, the North African equivalent of a Middle Eastern caravanserai or khan, which were lodgings for traders, their goods, and their camels, horses, donkeys and mules. These days fondouks tend to house craftsmen at work producing and selling their goods. In Fondouk Tadloui, halfway along the street on the left, you’ll find weavers, and vibrant striped tapestries, bags and poufs. In Fondouk Al Amri, a bit further down on the right, you’ll find a tile-maker and wood-workers crafting mashrabiya screens. At the arches, turn right. If you were to continue straight ahead you’d soon be in the thick of the souks, which can be overwhelming your first day. The turn right takes you into Derb Mouassine (‘derb’ means street, or ‘rue’ in French, and you’ll see a sign for Rue de Mouassine on the second arch), named after the magnificent mosque at the end of this street. On Derb Mouassine, on your left, you’ll find a hammam – note the retro signs ‘Bain Pour Hommes’ and ‘Bain Pour Femmes’ and the ‘Jus de Fruits’ stand in between – and a little further on, Café d’Arabe, a chic spot that’s perfect for lunch or a sunset drink at the rooftop bar. At the end of this little street you’ll reach a section with a wooden arcaded roof where there a few gorgeous shops, including an interiors store selling stunning, contemporary metalware made from stainless steel, pewter and tin, including Oriental lanterns, mirrors, and even clawfoot bathtubs. Turn right here, noting, after you turn the corner, the decorative doors of the Mosquee Mouassine on your left. 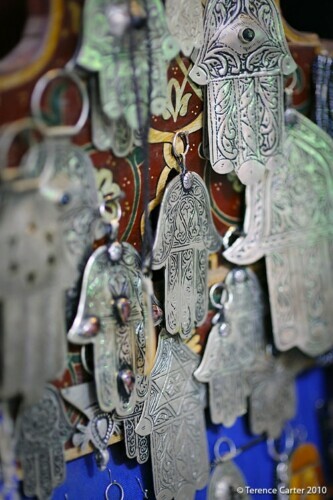 Within the covered section at the start of Rue Sidi El Yamami there are a handful of fabulous shops specializing in silver jewellery, chunky Berber necklaces, flamboyant gem-encrusted rings, bangles and pendants, and pretty khamsa (Hand of Fatima) earrings, charms, and amulets. On the left, Assouss Argane sells beauty products, soaps and essential oils made from Argan Oil, and opposite a fascinating little shop specialises in retro bric-a-brac and antiques from the early 20th century French Occupation. A little further on, Bougainvillea Café is a fine place for a mint tea. Turn left here. The long wonky street of Rue Fehl Chidmi, open to the sky for the most part and covered when it becomes Souk Laksour, is crammed with all kinds of wonderful shops and stalls all the way to the Place Djemaa El Fna. Halfway along, note the FNAQUE Berber Bookshop (a play on the French bookshop FNAC), which stocks a fabulous range of books on Morocco. 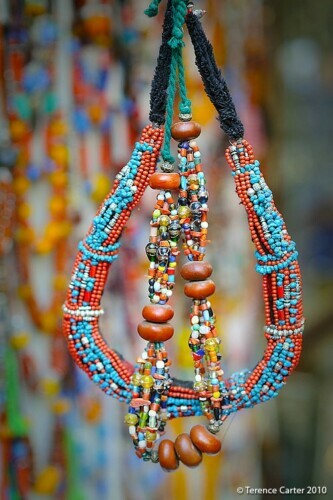 On this street and within the souq you’ll discover beautifully-made leather bags, satchels and ottomans, Berber jewellery and beads, Oriental lanterns, lamps, chandeliers and mirrors, and Moroccan kilims and Berber carpets. In the past (when I’ve not been on a one-year grand tour of the world), I’ve bold-coloured babouches (traditional pointy slippers), romantic glass perfume bottles, intricately-engraved trays and teapots, and sets of tiny tinted tea-glasses here. 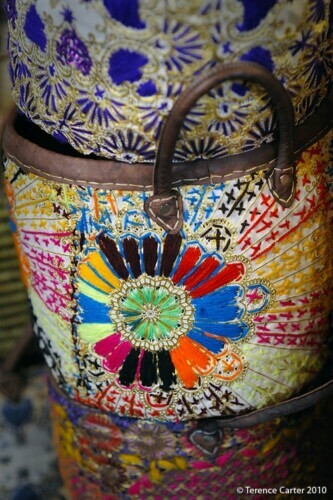 Other great buys include prettily-painted wooden mirrors and tables, conical ceramic tajine pots and small salt-and-pepper holders in the same shape, vibrant-coloured textiles, shawls, bags and poufs, funky sequinned shopping baskets, and tassels galore, from glass bottles and jars topped with tassel lids to colossal rope curtain tassels. 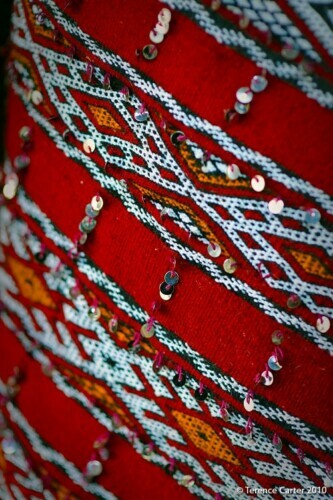 You’ll also find the usual generic Middle Eastern souvenirs found all over the region: belly-dancing costumes, checked keffiyehs/ghutrahs (Arab men’s headdress), and sequinned cushion covers and bedspreads from India. Our Marrakech medina meander ends of the main square, the Place Djemaa Al Fna. Tip: at the end of the souq, before you reach the Place Djemaa Al Fna, you’ll come to a square where you’ll find shops selling cheap suitcases, as well as a group of porters with carts and donkeys – just in case you need help lugging your purchases back to the riad! Lovely post – the pics are so colorful. It makes me want to get a big glass of fresh orange juice (best oj in the world in Morocco!) and go shopping! Can I ask what you use to display your photos so nicely? 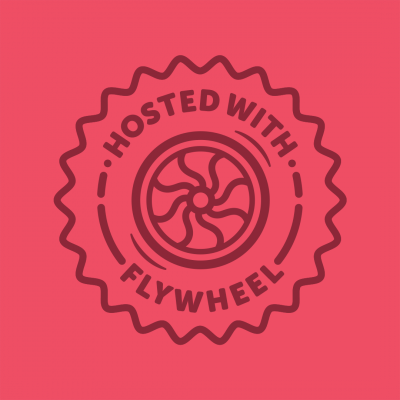 Do you use a specific plugin or simply set up a table in html? It looks so nice! Thanks for your kind words, totally agree about the orange juice! We use a plug-in for the photos (it’s called Lightbox) – we think it adds to the experience. Oy yay! 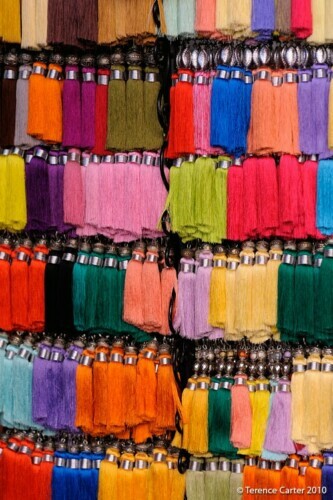 I LOVE shopping in Marrakech. 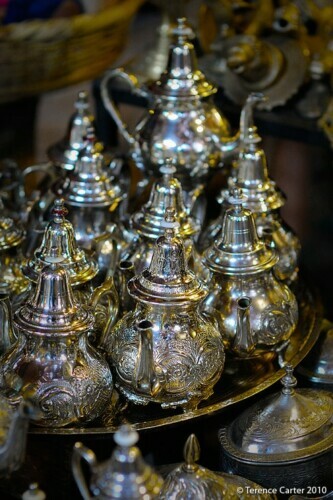 From our last trip, I brought home 2 tea sets, a rug, a few djellabas, books, photos, jewellery, incense, oils, and a brass-and-glass lantern that I hand-carried all the way from Marrakech to Toronto. My husband had to stop me from bringing more home! I wanted to have a wooden door shipped to me from La Porte D’Or, but dear husband said ‘NO’…I still think about that door ’til this day. WOW! I am even more excited now to visit Morocco! Thank you so much for this post. 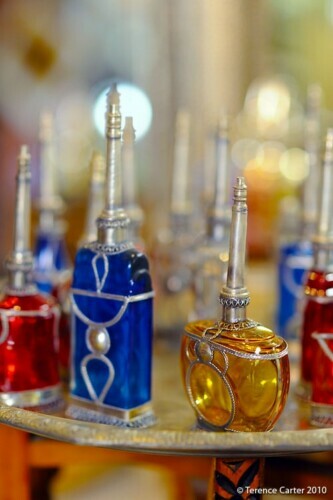 I will have to visit this post again when I am in Marrakech in March. Cannot wait to browse and shop (just a little). Sounds like fun. Did you actually buy anything? Must be a challenge deciding whether or not to buy when you know you’ll be on the move for so long. Hi Jen – I was the same the last couple of times we came here – bought a tonne of stuff; the first we backpacked all over the country, and the second time we drove everywhere, and both times I felt like a mule at the end lugging around all this stuff, enough to open a shop! Don’t you hate it when you keep dreaming of something? That’s when you definitely should have bought it! Hello Amy – the accommodation is lovely – it’s a very pretty riad. 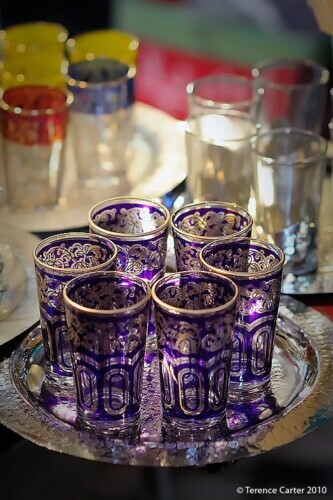 You should definitely visit Marrakech – I think staying in a riad is party of the Moroccan experience too. DTravelsRound – do visit again before you come here in March as we’ll have lots more content up by the end of this week. Enjoy your trip! Terry mentioned during the Dubai soiree that Marrakesh is one of the MUST SEE places in the world and I’ll have to agree just by looking at the photos and reading about your experiences there! 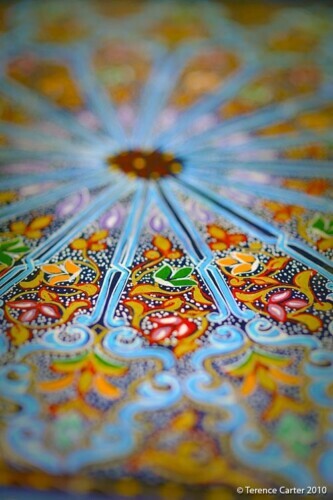 Love the colors, it would look so nice on any wall. Love how you ended this near the suitcases! I always ended up lugging extras bags back to Ifrane when I went south. I couldn’t resist buying malhafas (worn south of Marrakech by local women) to use as home decor. One time my friend and I bought fancy amalhafs (black garments, cross between a burka and a malfafa) but just one piece that you wrap around) in Tafrouate, but for the life of us we could not remember how to wear them. Every time I move I take it out of storage and try to figure it out, but I think I’ll have to go back to Tafrouate some day and ask the local women. We love Hong Kong, but we’ve never been to Scotland, believe it or not, so we’re excited that Edinburgh which actually be our last stop on our Grantourismo journey in January 2011. Thanks for dropping by! I’m glad you noticed that! Thank you! Don’t you hate it when you do that? I have memories of buying a number of things I could never figure out how to wear again once I got home. It always ends up being a simple little trick or technique, doesn’t it? Thanks for visiting us! What a great source of information you’ve gathered here! I’ve done a fair share of shopping myself in the Marrakech medina, and have heard of a really exciting area outside the city. It’s like an outlet area, and I was just wondering if you went there? Sorry, can’t remember the name! Hi Vibi, don’t know about that outlet area, do you mean all the little stalls on the way out of Marrakech with carpets & pots? I’ll get Lara to chime in as she’s the shopping expert. Have to say I love your travel portrait photography on http://www.photito.com – lovely stuff. That’s a shame, thanks for letting us know! We’ve taken it out of the story. Love the post and the images, brings back so many memories of a favourite destination. I like the presentation of the Lightbox plugin so much I’m going to take a look at it myself. Hi Iain – thanks! It’s long been a favourite destination of ours too. We’ve been using that plugin for a long time now. We decided not to jump on the Pinterest-style bandwagon and present larger pics in a chequerboard-style for a few reasons. Thanks for dropping by!